Gov. 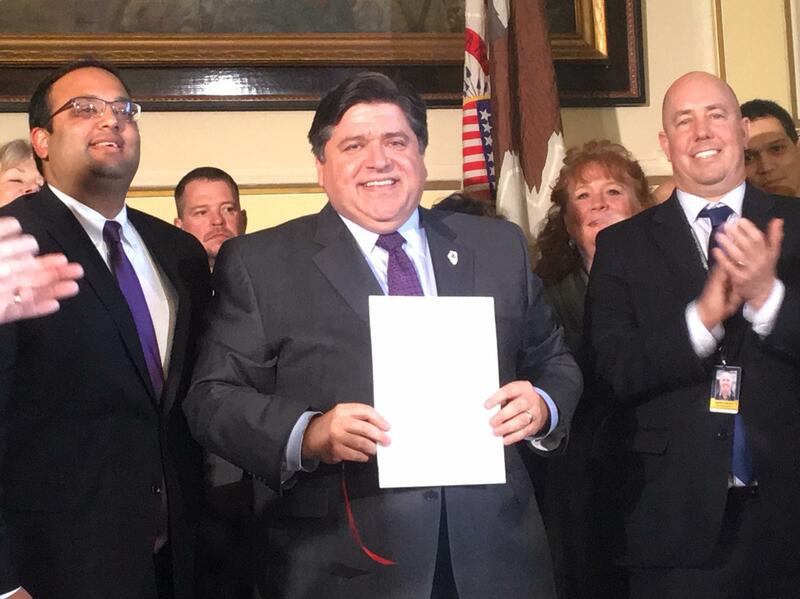 J.B. Pritzker signed a law banning local governments from creating "right-to-work zones." State Sen. Ram Villivalam (left) and Rep. Lance Yednock (right) sponsored the legislation. Pritzker said it’s another step toward ensuring working families can make a living wage. Former Gov. Bruce Rauner was a promoter of local right-to-work zones. He vetoed similar legislation in 2017. The U.S. Supreme Court has been asked to decide whether the suburban Chicago village of Lincolnshire can enforce a right-to-work ordinance. Lower courts sided with the unions, and Pritzker said the new law settles the issue. In a press conference after the bill signing, Pritzker effectively told Republicans to put up or shut up when it comes to his graduated income tax proposal. As it gains momentum, the governor is calling on opponents to lay out their own plan to fix Illinois’ finances. Pritzker said doing nothing is not an option, with the state facing a $7.9 billion bill backlog. He said Republican calls for spending cuts have been empty words. Pritzker has said his tax plan could raise $3.4 billion, though an independent analysis raises questions about whether his projections are too optimisitc. His budget also relies on pushing back pension payments, which is likely to drive up costs in the long run.